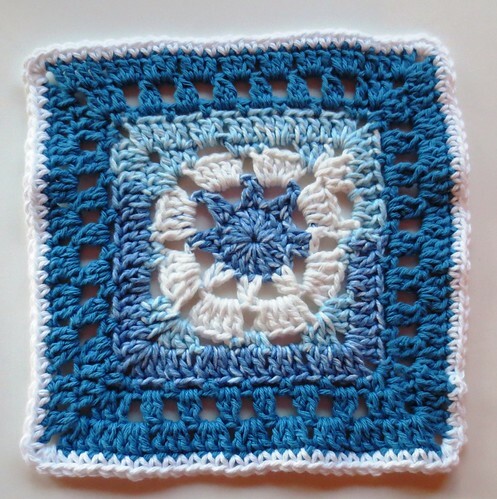 Here is a crocheted square pattern that I have tried and want to share my results. I love the center of this pattern with it’s spokes at the center. I first work the pattern with a scrap of cotton yarn in tie dye stripes. I set out to try the pattern and crochet just a dishcloth to see how I liked the pattern. Here is the result of working the pattern to just row 8 of the original pattern using a H (5 mm) crochet hook. I then crocheted one row of single crochet for trim with white cotton yarn. The finished result is a 9 inch square dishcloth.